I started months ago Sewing Old Jeans into a quilt; but, had trouble with my new sewing machine and other project became priority. Hopefully, I can get back to finishing it. While cleaning my craft corner I found another box of old jeans; so, I will have to try these projects with them. Cut around pockets from old jeans and set aside. 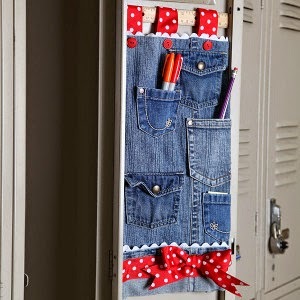 Use fabric from one denim pants leg to create the body of your organizer. Cut to desired size allowing for a half-inch seam allowance around all edges. Make sure the finished width of organizer matches your wooden ruler length. Fold all raw edges over to the backside and adhere with Fabric Fusion. Use large paper clips to hold seams in place until dry. 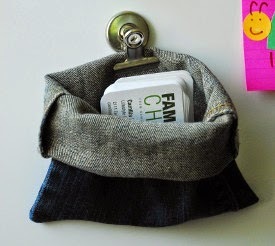 Use Fabric Fusion to adhere reserved jeans pockets onto organizer body. Lay flat until dry. Cut trims and rick rack to fit width of organizer. Where desired, apply trims and rick rack to organizer with Fabric Fusion. Let dry. Cut four lengths of ribbon to create loops for hanging. Make sure loops will accommodate wooden ruler. Secure to back of organizer with Fabric Fusion. Let dry. Hang finished organizer from wooden ruler inserted through ribbon loops. Cut enough denim to go around the can, positioning the seam at the top of the can. Hot glue the denim to the can and trim excess. Cut the letters A R T from patterned fabrics. Hot glue the letters to colored denim. Trim around the letters so that each letter has a denim border. 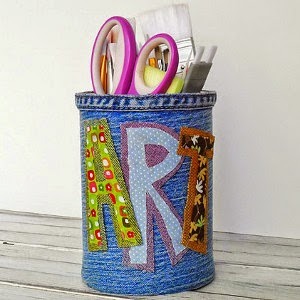 Glue the letters to the denim covered can, overlapping each letter. An individual could use iron on adhesive instead of sewing.